You’re feeling some indigestion after a meal, and then a little chest heaviness. It’s probably nothing. Or is it? If you’re a woman, you could be having a heart attack and not even know it. 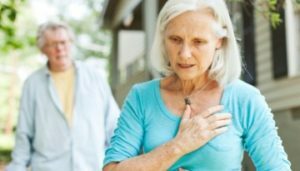 How can we distinguish a heart attack from other chest pain symptoms? Amy Silverstein was born with a rhythm problem called Arrhythmogenic Right Ventricular Dysplasia (ARVD). This lead to heart failure and not one, but two heart transplants. We’ll talk about her book based on her unbelievable journey, Sick Girl, and her remarkable life. Dr. Noel Peterson, Director of Women’s Cardiovascular Services at East Carolina Heart Institute will talk about how we can differentiate the pain of heart disease from other conditions, identify risk factors for chronic chest wall pain, and share the latest in diagnosing, treating, and preventing heart disease. Posted in Chest Pain, Exercise, Premium, Procedures, Radio Shows.